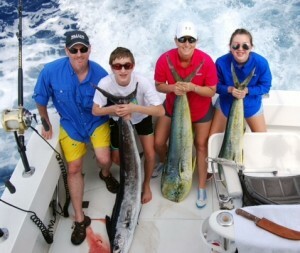 Banner Day Aboard Fire Hatt for Hank and Jinx! 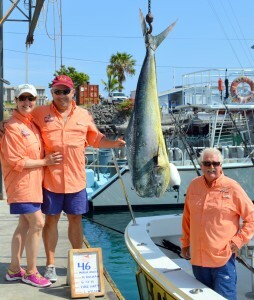 This is the third year Hank and Jinx have spent fishing in Kona Hawaii with us. Every year the stakes get a little higher, actually a lot higher! I don’t know what it is about these two, but they are fishy….this year Hank brought in our largest Mahi Mahi to date, a whopping 46 pounds. That is considered a nice one for these waters. As you can see in the photo it looks like we had assigned uniforms, it was just by luck that we arrived wearing what turned out to be a winning combination. With that in mind, Hank and Jinx hand washed the lucky garments and wore them again the following day….gotta tell you, the luck was there! On day one we had the Mahi along with a Blue Marlin Release, day two produced the nice Shortbill Spearfish for Jinx while the 150 pound Yellowfin Tuna came on the last day with Hank on the rod. We are looking forward to your visit next June and landing the elusive Ono! We love starting out each day with the greeting of Hi Hank, Hi Jinx! 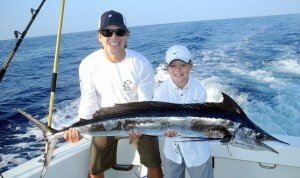 Awesome Spring Break for Corbin Kinder and his Dad, David from Houston, Texas. I start the story with Corbin and his Dad because it was an all Corbin day. As we headed straight out of the harbor to the 1000 fathom line things got busy right away. Just after the chair talk, the short rigger line came down screaming off line. We are Hooked Up! Corbin gets into the chair and the fight begins. Corbin brings in what turns out to be his first fish of the day. A nice 45 pound Shortbill Spearfish! While the deck is being cleared and lines go back out, we are still taking photos of the Spearfish when another line comes down. Hooked Up again! This time it’s a nice blue bullet on the stinger and line is screaming off as Corbin is back in the chair fighting what turns out to be an impressive 30+ pound Mahi Mahi! The stamina this young angler has is phenomenal. An hour goes by and things have settled down. 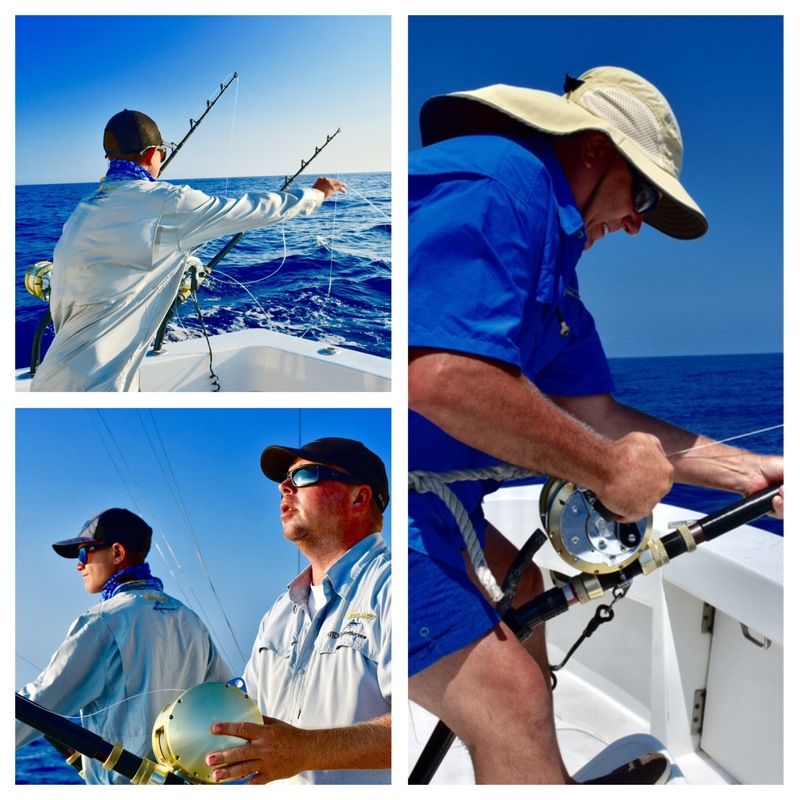 The crew today, Captain Joe Schumaker and First Mate Brett Lazenby are feeling quite proud of the activity so far when they get another strike, the stinger is bit again. Assuming that his Dad, David would bring this fish in was so wrong! Corbin jumped in and brought the fish to the boat, another Shortbill Spearfish! These are the days you dream of especially when you have young ones with you. We love having children on board and try our best to get something for them to pull on. This day will not be forgotten by Corbin and his Dad any time soon. Corbin has enjoyed fishing since he was 4 years old. Each year his Dad tries to take him to a different spot to fish. From offshore trips in Louisiana and Texas to the Caribbean and Central America he has caught Red Fish, Flounder, Barracuda and others. His Mahi Mahi he caught in Kona Hawaii aboard Fire Hatt was the biggest he has ever caught. He also enjoys fresh water bass fishing on our farm. Corbin has great patience in fishing and gets the “fishing bug” from his grandfather and great grandfather. We hope to see you guys again. The Barks Family have a Trophy Shortbill Spearfish, compliments of Kona Hawaii. 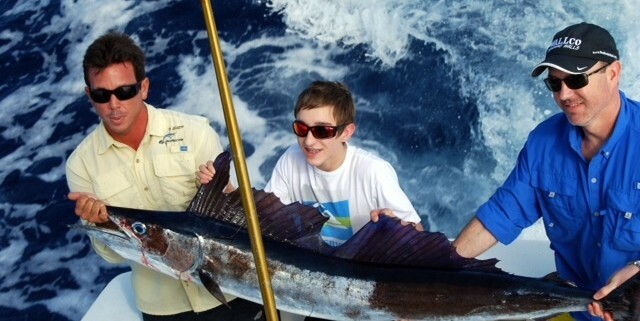 Fifteen year old Dillon Barks along with his parents Gary and Susan Barks and his sister Reagan fish aboard Fire Hatt for two days with lots of action. Day one started with Susan and Reagan both landing a couple of Mahi Mahi followed by the very nice Shortbill Spearfish being boated by Dillon. The Spearfish weighed in at 45 pounds. Not bad for this young man! Day two was a little slower in action but Dad did release a small Spearfish. The weather was not picture perfect for Kona during their visit, there was some light rain, swells and some clouds….but the fish didn’t seem to mind at all. This Fort Worth family proved to be troopers! A perfect Family Fishing Trip! Featured in the top photo is Fire Hatt Crewman, Brett Lazenby along with Dillon and Gary Barks. Featured in the lower photo is the Barks Family; Gary, Dillon, Susan and Reagan from Fort Worth, TX. The forecast for March and April typically is slightly warmer water arriving, an uptick in the numbers of Blue Marlin and strong numbers of Striped Marlin, Shortbilled Spearfish and big Ahi (Yellow Fin Tuna) under the porpoise schools. 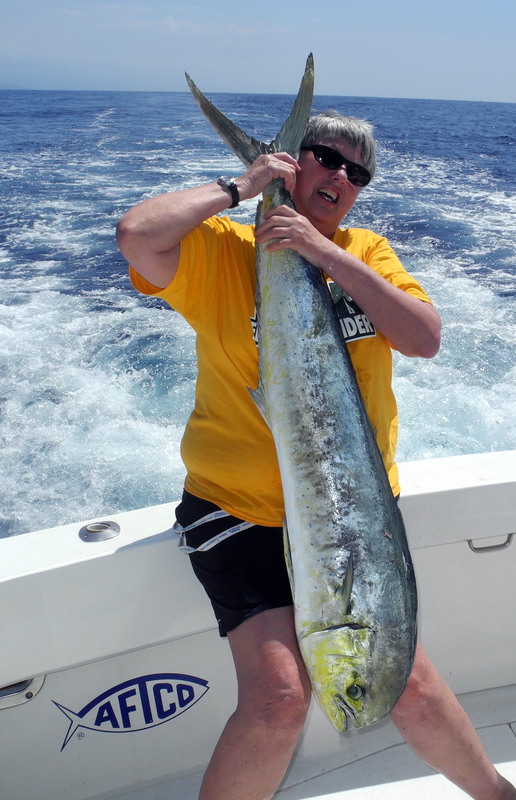 Mahi are in peak season and some of the larger Bulls will be caught now. One way to look at how water goes by the Islands is to imagine a bathtub of water over 1500 miles across between 77 and 79 degrees. 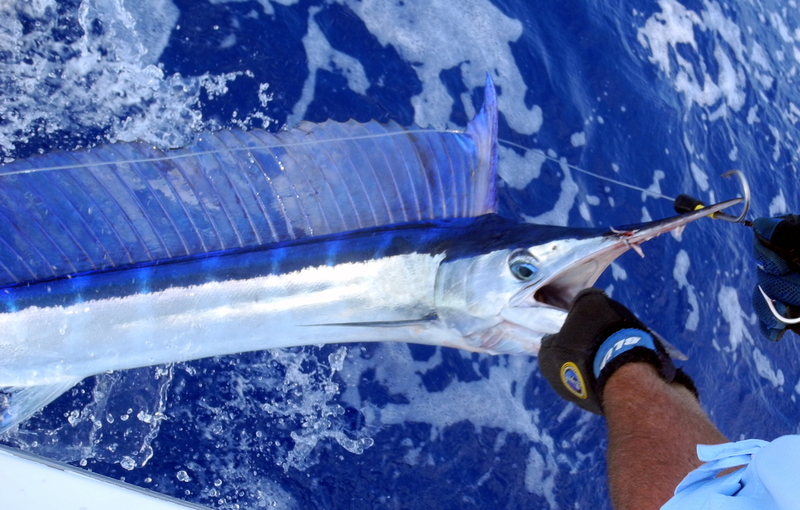 That is the one here now and is a little cooler and Mahi, Spearfish and Striped Marlin love our coolest water. 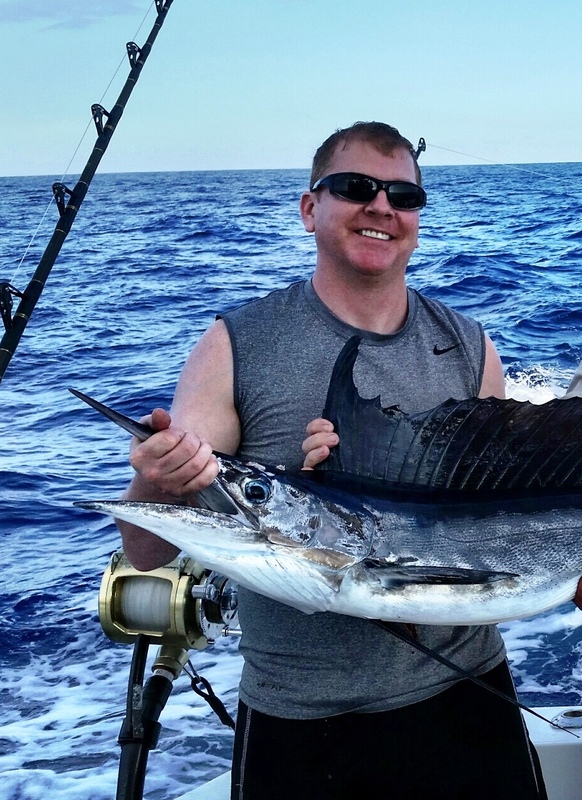 Coming next in the 79 to 81 degree “Bathtub” will be big numbers of Ono (Wahoo) usually starting in late March and April, and some Black Marlin. 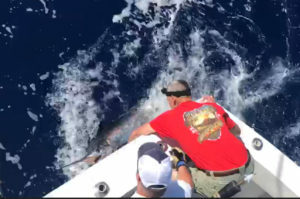 One thing for sure, the Black Marlin here are small, a 300 pound one is big in Hawaii, compared to Australia and the Southern Hemisphere where they go to 1500 pounds. Bait fishing will also improve and the offshore FAD’S (Fish Aggravating Device also known as Fish Attracting Device) will start collecting bait and their predators’ which is great news for anglers. When you a book a Charter boat in Kona, most of the Captain’s will have fresh information on what happened and where it happened over the last few days. 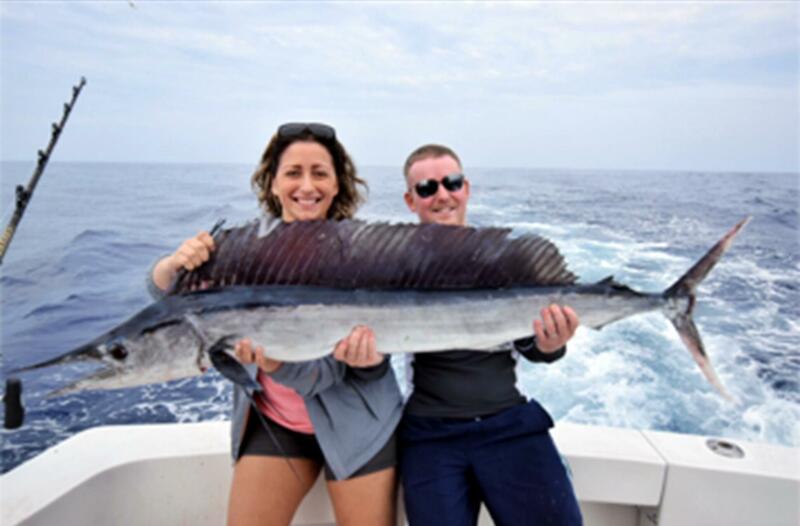 In February, the Mahi and Spearfish bite had been excellent and FIRE HATT boated a 45 pound Short Billed Spearfish in early February as well as an almost daily Mahi Mahi. Blue Marlin are still around in the 77 degree water we have off the Kona Coast now and their numbers will only continue to grow as we head to our peak summer season.